On my walk in to Wild Birds Unlimited I found an exoskeleton of a cicada on a street light pole. Cicadas are found all around the world and there are about 10 species in Michigan. 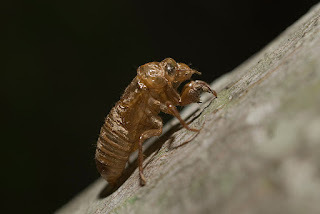 BioKIDS exlpains: Newly-hatched cicadas climb or drop down to the ground from the branch their egg was in. They burrow into the ground and start feeding on the plant juices in roots. As they grow they shed their exoskeleton several times. They sometimes spend many years in the soil before they are finished growing. For some species it takes 13 years, others take 17, and some take less, but nobody knows exactly how long. Cicadas don't have strong effects on humans one way or another. They can be a nuisance when there are millions of them, but they don't bite or sting. When they are mature, they climb out of the ground and complete one final molt. They emerge as an adult cicada with wings, and fly away to find a mate. Once they become an adult they stop growing and do not molt again. In my mind the buzzing sound they make is very much associated with late summer evenings. The sound comes from their tymbals, the corrugated exoskeleton on their torso that they contract and release. Cicada males make sounds to attract nearby females, who respond by snapping their wings. Hi Sarah. Took this picture on Dewitt Road in St John's. I just cannot figure out what they are. So sorry the picture isn't better, hope you can help. I couldn't stop very long because of traffic, so just a quick snap. Thanks so much. 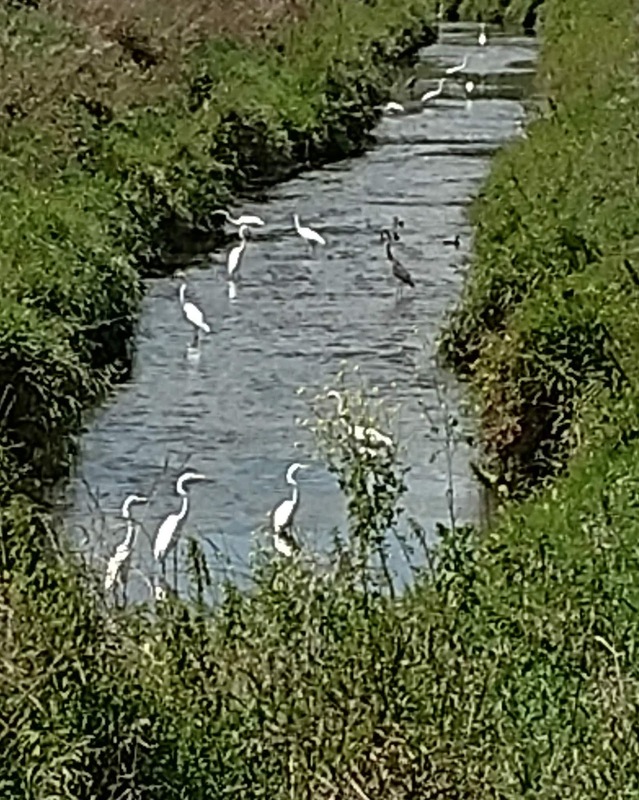 In August, juvenile Great Egrets disperse from their natal site to many wetlands around the region. 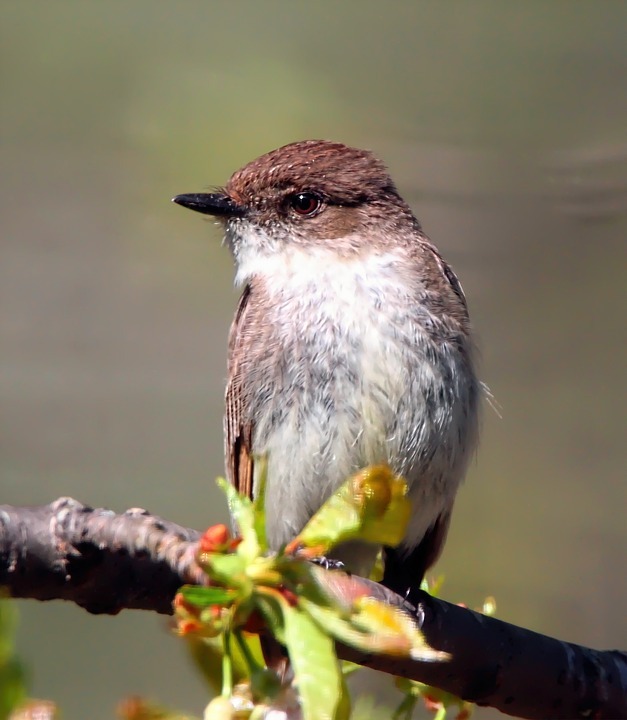 You may see congregations of 5 to 30 birds foraging during the day or roosting in trees at night. They should remain in Michigan through October. 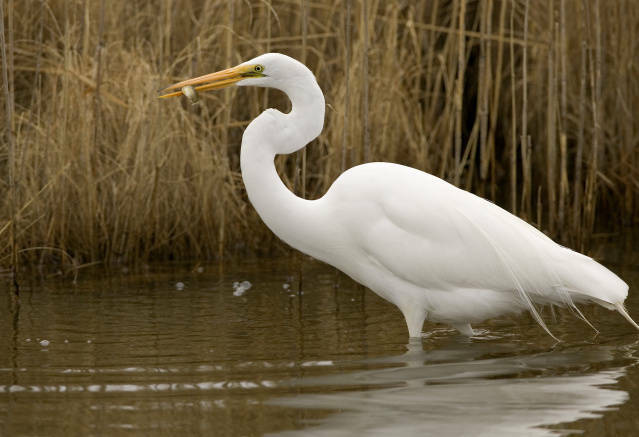 They especially like the undeveloped portions of lakes and shallow, marshy wetlands where they feed on small fish, crayfish, frogs, tadpoles and an occasional snake. A lot of these birds are post season wanderers from the southern states. 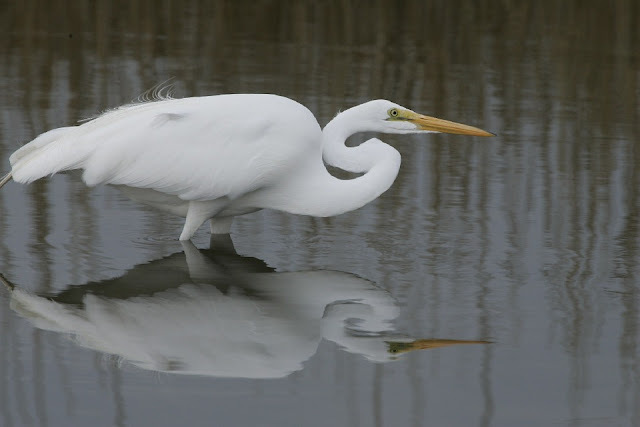 From allboutbirds: Visit a pond or marsh and look for an all-white bird—slightly smaller than a Great Blue Heron, with black legs and a yellow bill. It may be wading slowly or standing stock-still, peering intently at the water as it searches for fish. 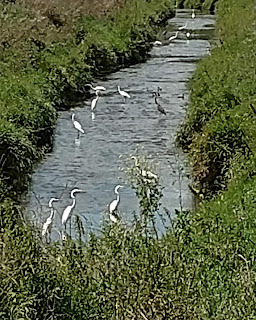 If you live outside of the species’ breeding range, you may still see Great Egrets in late summer as they move about widely before heading to their wintering grounds. Thank you for sharing you nature photo! If anyone else would like to share a photograph of nature send it to bloubird@gmail.com with a description and permission to post it on the Friday Photo. 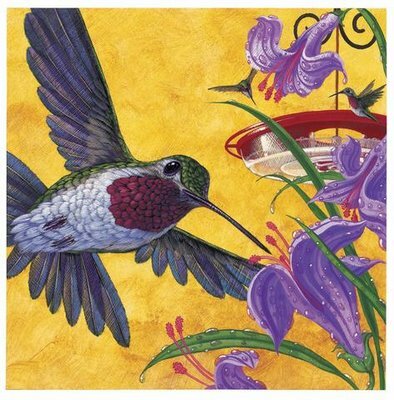 On the nights when it gets cold or it rains you may wonder where a little hummingbird that weighs as little as a penny goes to spend the night. 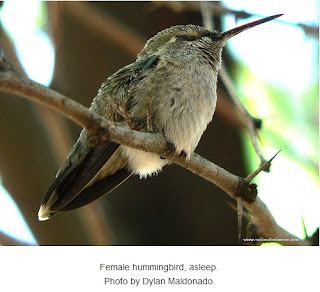 While sleeping, hummingbirds are vulnerable to an attack by a predator, even more so than other birds. Most birds find a sheltered perch to roost at night, lock their toes on a branch and sleep with one eye open, always on the lookout for danger. Hummingbirds find a nice and sheltered place at night, and they latch onto a branch with their tiny feet, and then they go to sleep. But they don't just sleep, they go into a deep sleep called torpor, where they can lower the amount of energy they use by about 85 percent. They do this by basically shutting down a bunch of their bodily functions. It is like a mini hibernation where they lower their body temperature and their heart rate drops to only a few beats per minute. However, unlike hibernation, hummingbird torpor can occur on any night of the year so it is referred to as daily torpor or noctivation. Even tropical hummingbird species that also have limited metabolic energy, rely on daily torpor to conserve energy. Hummers in torpor are fluffed but rigid and cold to the touch. In the morning, it takes them 20 to 30 minutes for their body to raise their internal temperature back up. They take that risk just to have enough energy in their tiny bodies to make it to the next morning. It is important for them to load up right before they sleep and then in the morning hummingbirds will eat 25% of their daily intake as soon as they recover from torpor. So keep those feeders full of fresh nectar. 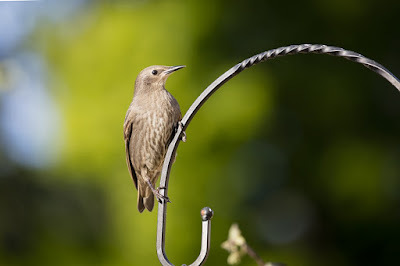 European Starlings are pretty common to see at mid-Michigan bird feeders. But the way they wear their feathers can make their identification difficult at times. 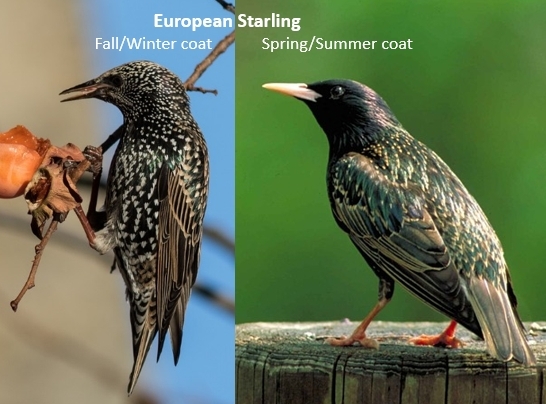 After a long winter starlings have worn off their stars and look black or an iridescent purplish-green in the sun with yellow beaks. The babies almost look like a different species. They have fluffy dark gray feathers when they first fledge. At the end of summer the babies start to grow a black and white spotted vest. Then eventually their whole body will be covered by dark feathers with white tips. 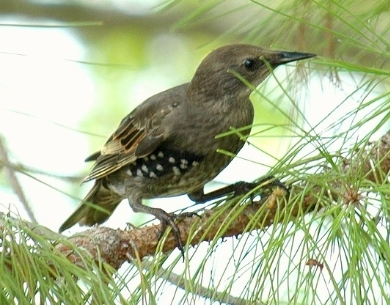 The white tips give the bird a spotted look or the appearance of “stars” covering their body, hence the name starling. Adult starlings also go through a complete molt in late summer. Their bill color changes from yellow to black and new feathers with white tips are grown as winter approaches. Over the winter sunlight and weather dulls the speckled look and by breeding season they are back to the uniform dark brown or black. 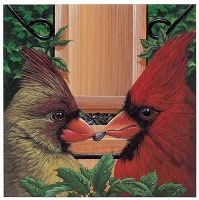 Males sport a bluish spot at the base of their beaks, while the female displays a reddish pink speck. Starlings tend to leave the feeders in the fall. They switch their diet in the winter to mainly fruits, nuts, and berries. During the day you can see them hanging out on wires along the roadside. There must be something in the air for the mantis. On Thursday, I plucked one off a wall at Frandor with my umbrella in the morning and placed it in a tree. On Friday, there were four; three large and one small. The attached pic is after work so that one never moved. The other three were gone. The pics in the arborvitae were today. I just went and checked. It's still there. Could it be love in the air? The reason you've been seeing so many lately is because this is their mating season. Mantids hatch in the spring, spend the summer maturing, and then get busy in autumn before they die. The eggs laid in the fall will weather the Michigan winter before releasing the next generation in the following spring. Michigan has two species of Praying Mantis: The European Praying Mantis (Mantis religiosa) and the Chinese Mantis (Tenodera aridifolia). As their names imply, neither Michigan mantid is native to the region. Though they have been on this continent for more than a hundred years (long enough that some sources peg the American versions as subspecies), they were imported, probably by farmers looking for some pest control. Mantids are carnivores, and they will prey on smaller, more annoying bugs; unfortunately, the reality is that most mantids don't have a large hunting range, and so their practical use as a garden pest deterrent is limited. Your great photos look like the European mantis. 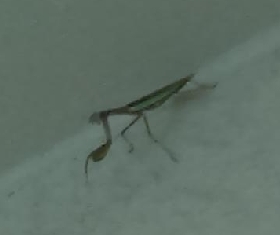 They are smaller than the Chinese mantis, measuring 2-3 inches on average. They also have the most distinctive "mantis" structure -- the prominent folded legs, the V-shaped head, the leafy green exterior. Thank you for sharing you nature photos! If anyone else would like to share a photograph of nature send it to bloubird@gmail.com with a description and permission to post it on the Friday Photo. Most birds grow a fresh coat of feathers in the fall. 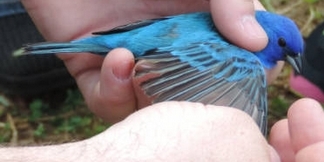 During this feather molt, birds may become less agile in flight and seek a protected habitat with a reliable food supply. And because feathers make up 4–12% of a bird's body weight, it takes a large amount of energy to replace them. For the next few months, keep your feeders clean and full of fresh food to help them during this stressful time. Right now I am watching juvenile male House Finches growing their red feathers. 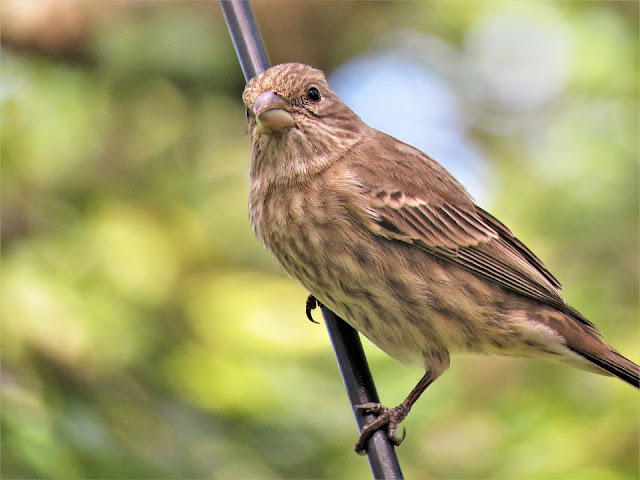 I wrote before about how the young House Finches were sporting baby feather plumes on their head. Now you are going to see a lot of young house finch males putting on their big boy colors. The girls will remain brown and creamy but the you will start to see red on the boys. The House Finches are a familiar sight in mid-Michigan today. 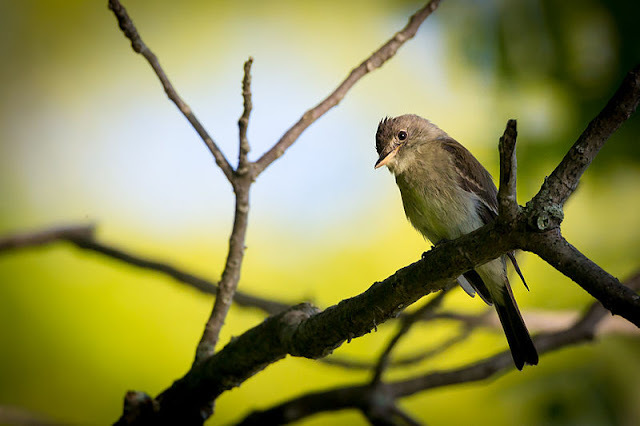 These 6″, talkative little birds get their name from their habit of hanging around houses. 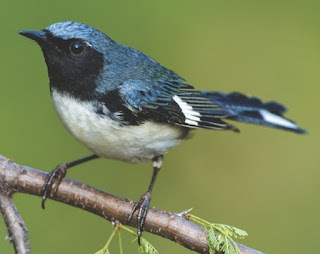 They build their nests in the hanging baskets, wreaths, or in trees, and their cheery warble or a variety of chirps is a constant around the bird feeders. The amount of red the finch has can vary depending on the quality of their food during molt. 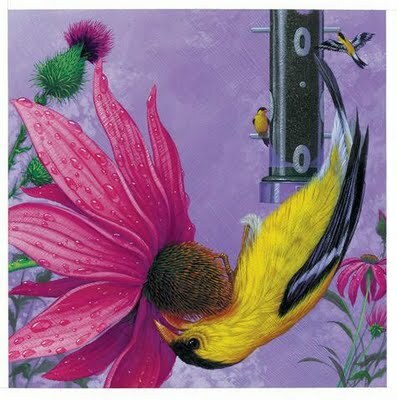 The goldfinch are feasting on the flowers at the Wild Birds Unlimited store. Brown Eyed Susan (Rudbeckia triloba) is a plant that will grow under diverse conditions. Even with the dry, hot summer we had this year, there were enough clusters of flowers to attract a charm of finches. Goldfinches will eat the tiny black seeds on the plant, and as the seeds scatter on the ground they will attract buntings, sparrows, and other birds. Because of superstitious beliefs in some cultures, black cats are sometimes associated with bad luck and, sadly, not chosen to be adopted from shelters. 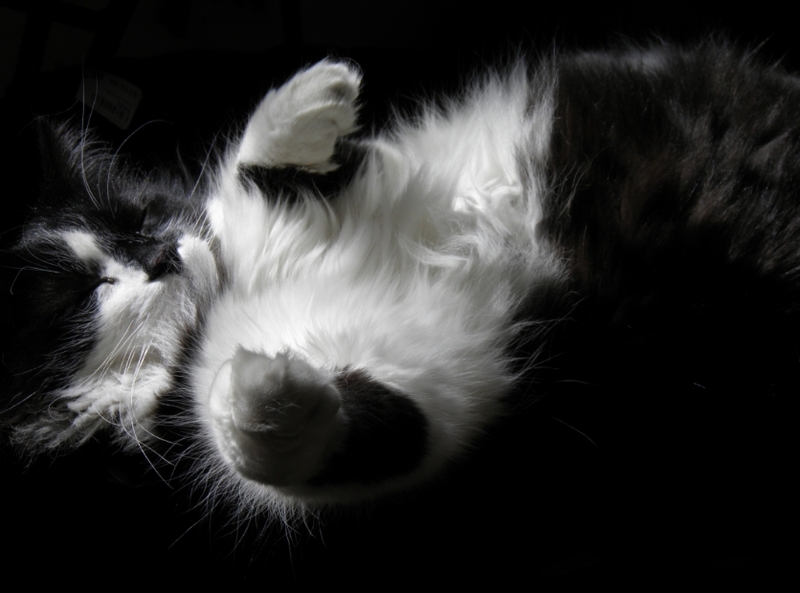 Black Cat Appreciation Day was launched to show people that a black cat could be the perfect cat for them, and help raise awareness about black cats in general. If you’ve been looking for a rescue cat yourself, why not consider a black cat? Not only are the superstitions about them bringing bad luck completely untrue, but you might find a black cat to be a fantastic feline companion for you! On Black Cat Appreciation Day, a fun way to celebrate, if you own a black cat, is to take photos with your pet to share and spread awareness about the day on social media. 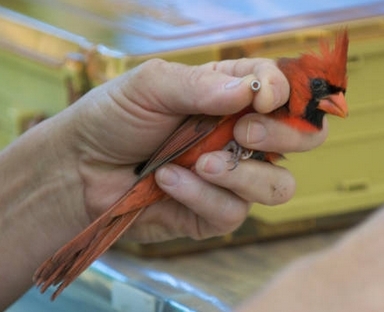 Burke Lake Banding Station is open to visitors – anyone can come and observe the banding, and long-term data collection on the health of the bird community. Part of their mission is to engage with the locals to provide opportunities to connect with nature through hands-on experiences. This creates enthusiasm and appreciation for natural resources and fosters an intrinsic value of wildlife. Would you like to become more involved at the station? Volunteers help in all sorts of ways! 1. Where Burke Banding station located? The station is in Bath, Michigan, just to the northeast of Lansing, MI. The parking area of our station is located on the north side of Clark Rd, almost exactly 1 mile east from the Clark Rd/Upton Rd intersection. Once you arrive, follow the signs to the station. Please note the signs are only up when they are open. If you do not see signs then the site is closed! This is usually due to rain, as it is unsafe to catch birds in the rain. 2. When is it open? In 2018 they are open August 18- Oct 15. Please check the online BULA Calendar for the days and times. 3. What can we expect when we arrive? When you arrive to the parking area you will follow the arrows on the BULA signs to the banding tent, which is roughly a 2-5 minute walk. You will see our tent in a clearing and likely people in the area. If you do not see people, that means everyone went on a net run to collect the birds. PLEASE, stay at the tent until they are back. 4. Can we help take birds out of the nets? No, all of the staff and regular, dedicated interns are listed under the Director’s master’s permit. However, if you are interested in being a dedicated volunteer please talk with the Site Coordinator, Site Director, or Bander about opportunities. There is one-on-one training for dedicated individuals. 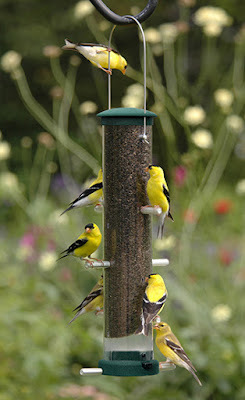 If you love watching bird behavior, there is nothing as fun as observing the American Goldfinches. 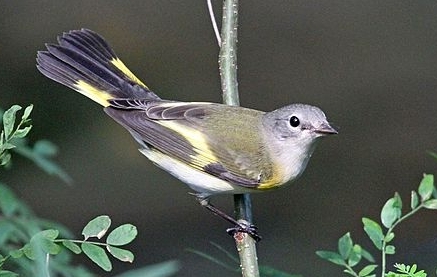 These small bright yellow and black birds have a roller-coaster flight and a lovely song. They roam from garden to garden making the flowers dance as they eat seed heads until late summer when they choose a territory where they will nest. 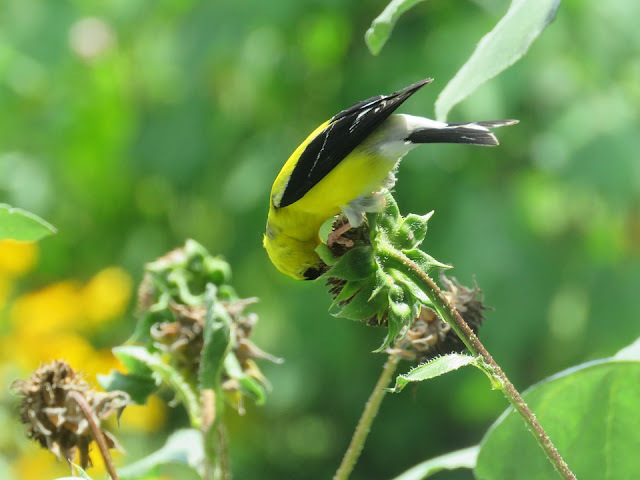 While most birds have finished nesting and some are flying south, the American Goldfinches delay the start of their nesting behavior until the thistles and other flowers come into bloom so they can anticipate an abundant and reliable supply of seeds for their young. Loud, incessant demands for food and fluttering wings help you identify baby finches pretty quick. The immature American goldfinch has a dull brown back, and the underside is pale yellow. 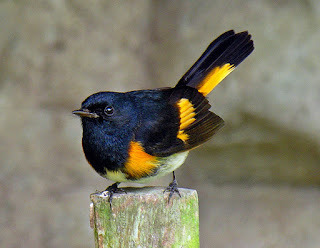 The shoulders and tail are dull black with two buff-colored wing bars, rather than an adult’s white. This coloration is the same in both male and female babies. 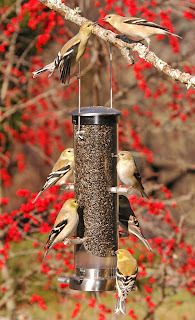 With so many mouths to feed there are often squabbles at the feeders for perches. I have 5 Finch Feeders, as well as Seed and cylinder feeders and a lot of natural foods like coneflowers and they still are pecking for positions. These friendly squabbles, beautiful songs, and bright colors are why they are one of my favorite birds. I started feeding my finches a good blend from Audubon and they refuse to eat any other. What do I do. This food is expensive and we have MANY finches. Thanks for your help. At the feeders goldfinches like to eat Nyjer® (thistle) and Sunflower seeds. 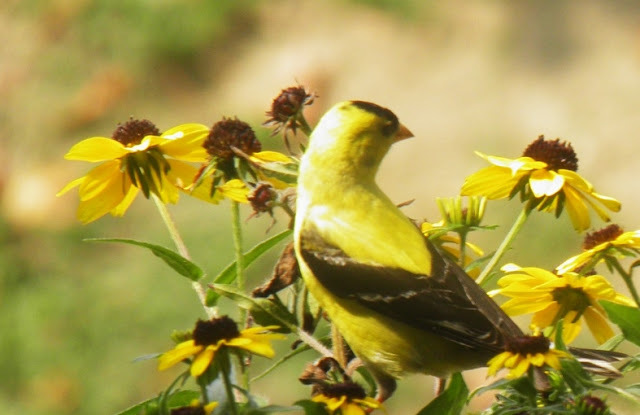 Don't get any blend with filler seeds the birds don't like such as canary grass seed, millet, or flax seed for the goldfinches. It is important to keep the food fresh because finches can be picky eaters. Nyjer and sunflower chips are vulnerable to spoilage while in the tube. Once seed starts to get moldy or becomes stale, finches will look for alternatives. 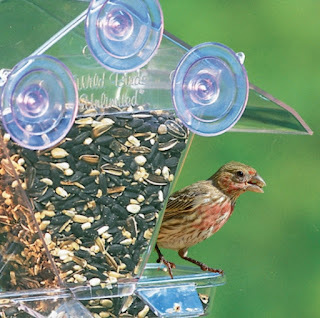 Replace food in finch feeders every three to four weeks if it is not being eaten actively. Store your seed in a cool dry spot for a longer shelf life, and buy in quantities that will be used up in a few weeks. In addition to feeders, the right native plants, arranged to mimic natural ecosystems, will provide birds with food, water, shelter, and nesting places. You can find which plants birds like by going to the National Audubon Society’s Plants for Birds website, here. Type in your zip code, and you will see a list of native plants that benefit local bird species, as well as local resources and links to more information. House Finches are non-migratory. They tend to stay near their nesting areas over winter, but they may wander widely for food. Yard feeders have helped their year-round survival. While the boys have red on the head, upper breast and brown streaks on the belly and flanks, females are plain brown, with heavily streaked white chests. House Finches may be confused with Purple Finches. Purple Finche males have a more reddish color on their upper parts and are not streaked on their abdomens. Both male and female House Finches sing lovely warbler-like songs and have a sweet, quiet chatter calls that you can hear when they visit feeders. They are very social birds, and after the nesting season, they merge into family flocks for the rest of the year. In groups, females are usually dominant over males. House Finches are almost strictly vegetarian and approximately 97% of their diet is made up of buds, seeds, and fruits. 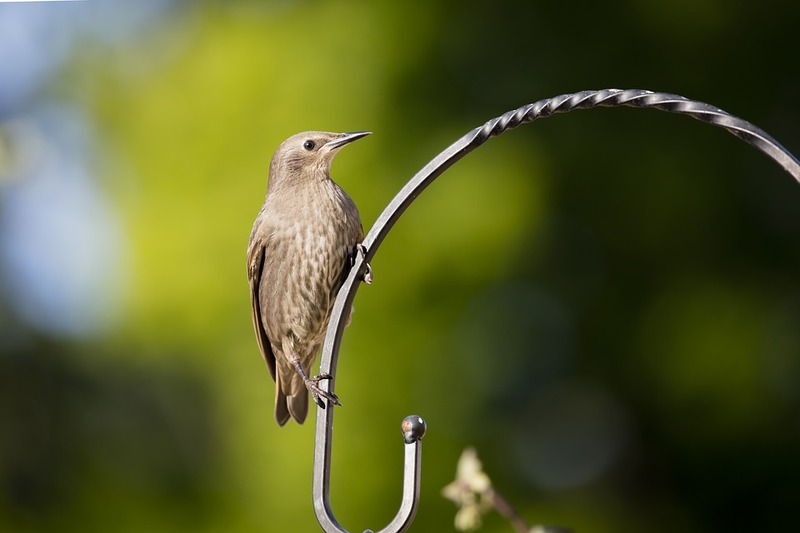 They are strongly attracted to feeders, with sunflower or safflower seeds. 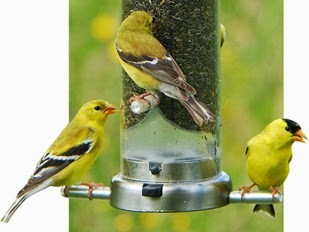 They love my Safflower Seed Cylinder feeder and the fruit and jelly at my oriole feeders. This morning on my walk to the Wild Birds Unlimited store I was amazed by the number of American Robins calling at the top of trees. At the end of summer robins wander around in flocks between fruit trees and roost trees in a neighborhood. Their diet switches from mainly bugs to more fruits, nuts, and berries. When a brood of baby robins fledge, they are taught by both parents for a few days on how to forage for food. Eventually daddy robin leads the juveniles to a well-sheltered stand of trees or shrubs to hang out with other juveniles before he returns alone to start another brood. Young robins learn that being in groups, or flocks, is normal. 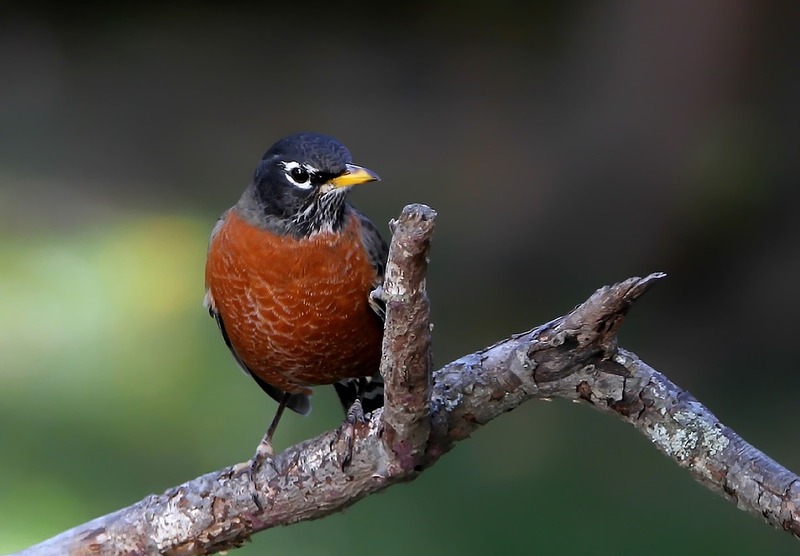 Robins are territorial on their summer breeding territories, but not at their roosts. Advantages to being in flocks are that more eyes can search for food sources, and be watchful for predators. To help robins in autumn, you can make your backyard bird-friendly. Leave some dead leaves under trees and shrubs for birds to forage for insects as weather gets cold. Provide cover by not cutting back dead vegetation like dried flowers, and vines. 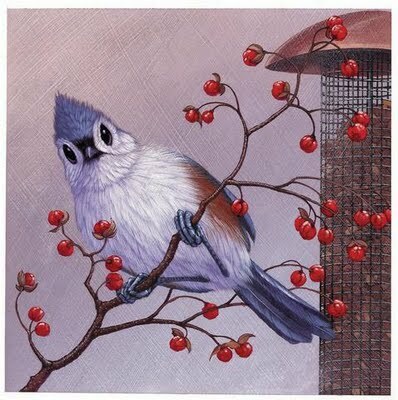 Plant more berry bushes or fruit trees as food sources for robins migrating through, or overwintering in the area. Hummingbirds are the only birds that can hover in still air for 30 seconds or more. The wings of some species flap up to a hundred times per second. Having a feeder up close lets you watch them in action. In July, after chicks fledge you may see an increase of hummingbird activity at the feeders. The numbers of birds feeding will grow and then decline as migration begins in late summer and early fall. You will literally see these tiny, skinny hummingbirds loading up for several days and turn into round, rolly-polly birds. Then when the perfect wind blows they head south. The first wave to depart is mainly made up of male hummingbirds, followed by the females and then the young. 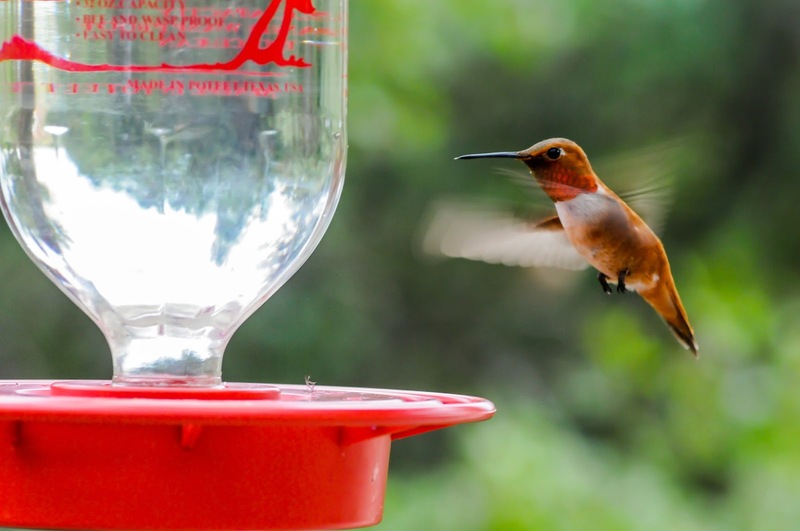 In addition to your loyal, frequently feeding hummingbirds, migrants from farther north may stop for a rest and a sugar-water pick-me-up as they are passing through. 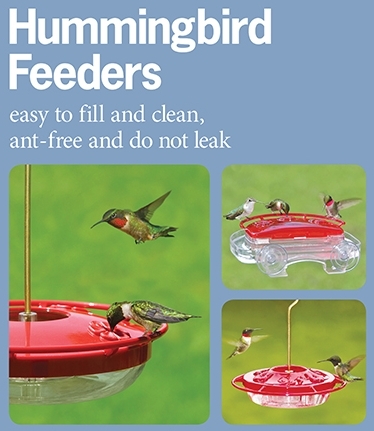 So keep your feeders clean and full of fresh nectar. If they find you on the way south, they will find you again on the way north next spring. 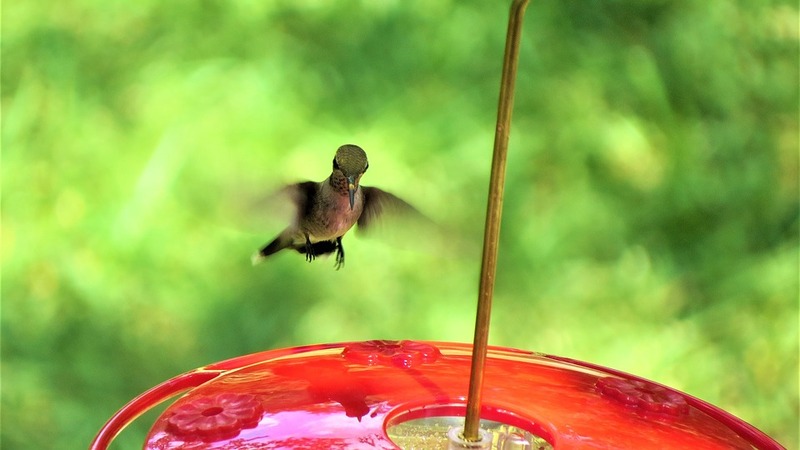 Keeping your feeders up in the fall will NOT cause hummers to delay migration. Many factors trigger birds to migrate, but the strongest one is day length. As days grow shorter in late summer, hummingbirds get restless and start to head south, regardless of whether there are feeders around. 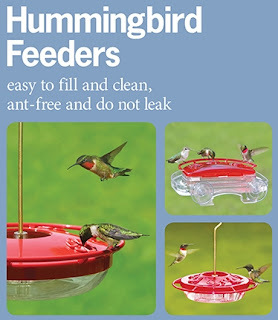 In fact, several hummingbird accounts in Birds of North America Online also note that feeders may help hummingbirds survive in early spring or late fall when flowers are not in bloom. Nottingham Nature Nook came in to Wild Birds Unlimited for more mealworms to feed their rescued baby birds. Cheryl is just releasing the Eastern Phoebes that came in as little pipsqueaks. This will give them enough time to learn how to forage and fatten up before they feel the urge to migrate south in September. They winter along the Gulf Coast and especially heavy concentrations in eastern central Texas and Florida. Southern limits extend well into Mexico along the Atlantic Coast and in the interior, south to central Veracruz, and west to Chihuahua and also in the Bahamas. - Shilly-shallying Golden-crowned Kinglet: Adorable! Finch feeders have very small feeding ports to control the flow of the teeny tiny Nyjer® (thistle) seed but still allow skinny-billed finches to extract a seed. There are two popular styles. One is a stabilized, polycarbonate tube that has a perches for the birds to stand on and pick a seed from a slit in a tube. The other is a mesh tube where the birds cling and pluck seeds from any open spot. One problem people often mention when feeding finches Nyjer® (thistle) is the waste of seed below. Unfortunately as small as nyjer seeds are, the black part on the outside is merely the shell finches split open efficiently to extract the high fat, high protein oil within. So actually what looks like wasted seed is probably just lots of tiny shells. Fortunately this seed has been heat treat so that if one seed does escape a finch’s grasp it won’t sprout. Another benefit to finch feeders is that the squirrels and larger birds will leave it alone. Goldfinches are the main bird attracted to straight Nyjer® (thistle). A few other birds attracted are House finches, chickadees, sparrows, siskins, doves, buntings, redpolls and juncos. There is just something about a baby goldfinches squeaky voices that bring me great joy! 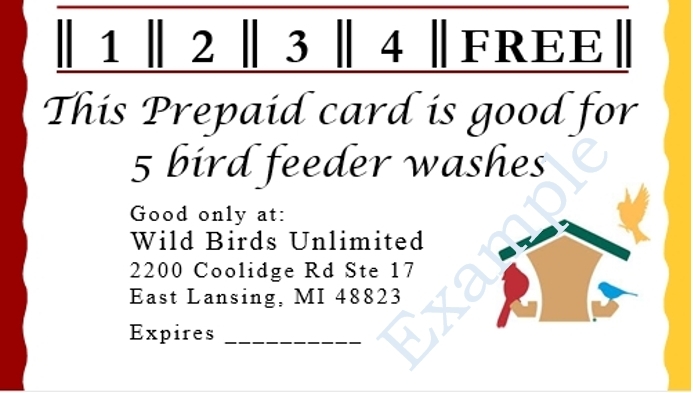 This week I heard the first batch at my feeders at the Wild Birds Unlimited store in East Lansing. So make sure your feeders are clean and full of fresh seed. It is common for the goldfinches to stop visiting the feeders for awhile in the spring and early summer, but they return in late summer when they begin nesting. 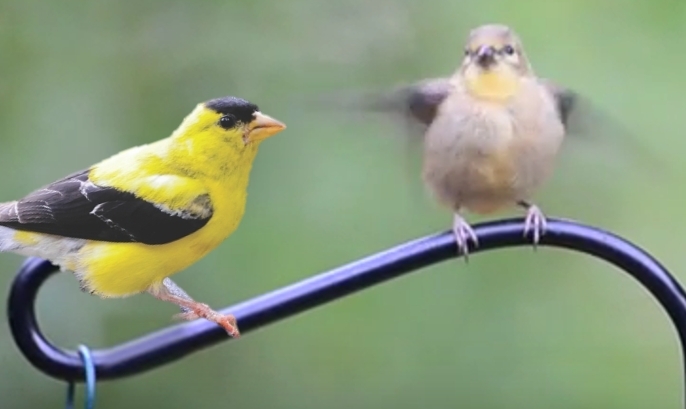 For every two American Goldfinches you may have had at your Feeders during the Spring and early Summer, you'll probably now have another four hungry babies tagging along. If your seed has been just sitting in the feeder with no customers, take it down, clean it up, and refill it with fresh seed. Goldfinches are pretty finicky. They like the freshest food full of fat and the cleanest feeders. At my house they can get sunflower from the feeders that are filled with the Wild Birds Unlimited No-mess blend. 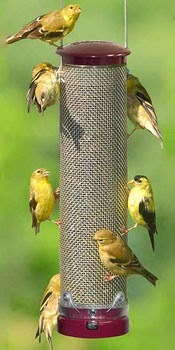 Or they love Finch Feeders filled with Nyjer® (thistle). American Goldfinches are vegetarians. You can also garden for them with flowers that produce seed heads like milkweed, yarrow, asters, cosmos, black-eyed-Susans or Coneflowers, along with feeders that have Sunflower seed or Nyjer® (thistle). Most of the blackbirds have finished nesting and have already moved south. Robins and cardinals have stopped their dawn songs. I woke up this morning to no songs. I hope that will not be for long because I am anxiously awaiting the arrival of baby goldfinches to the feeders in my yard! From mid-August to October most of Michigan will wake up every morning to the tinkling tune of baby goldfinches. They look similar to the females or goldfinches in winter colors and their baby call is a "♪ High, low...♪ high, low, low." 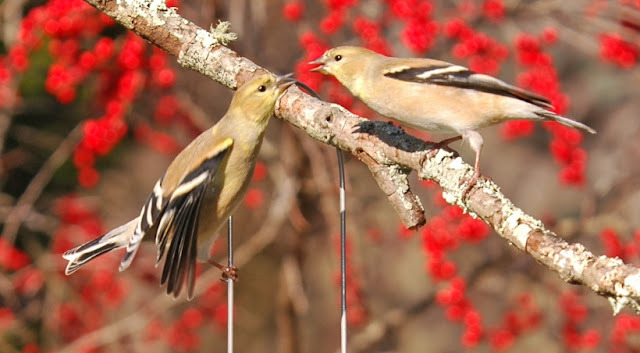 The immature American goldfinch has a dull brown back, and the underside is pale yellow. The shoulders and tail are dull black with two buff-colored wing bars, rather than an adult’s white. This coloration is the same in both male and female. 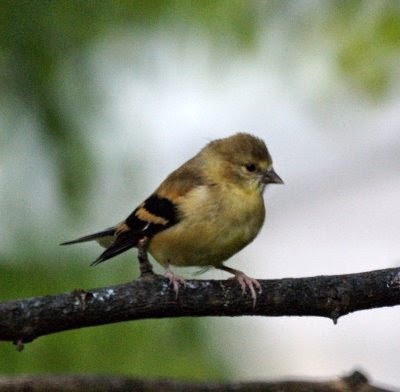 If you still aren’t sure if it is a baby or a female goldfinch, look at the feathers. Young American Goldfinches have fine, clean feathers and the adults will look worn out as they molt their feathers for winter.